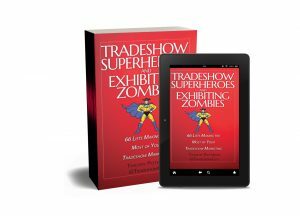 Thanks to a recent post on tradeshow-exhibiting Zombies published here on the Tradeshow Guy Blog, Mel White, VP of Business Development for Classic Exhibits, was suitably inspired to come up with a Top Ten List on what we can all learn from zombies. 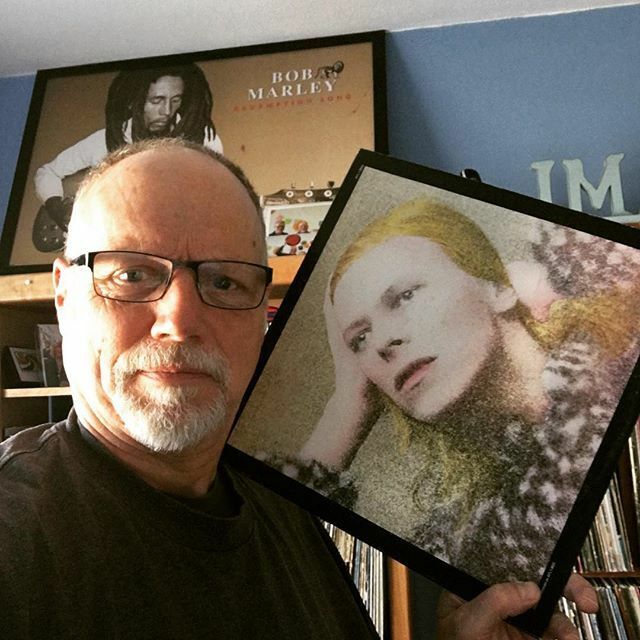 Thanks for sharing, Mel! Single-minded Focus. You may not appreciate their all-consuming desire to eat your flesh, but they are committed to the task. They let nothing get in their way, except an ax to the brain. Your next trade show will be wildly successful, if you make it a priority, not an afterthought. Teamwork. Zombies travel in packs, like ravenous hyenas. That teamwork ensures them a much higher percentage of kills. There’s a reason “We killed it” signifies success. By working together, those poor doe-eyed attendees don’t stand a chance. Appearance Matters. 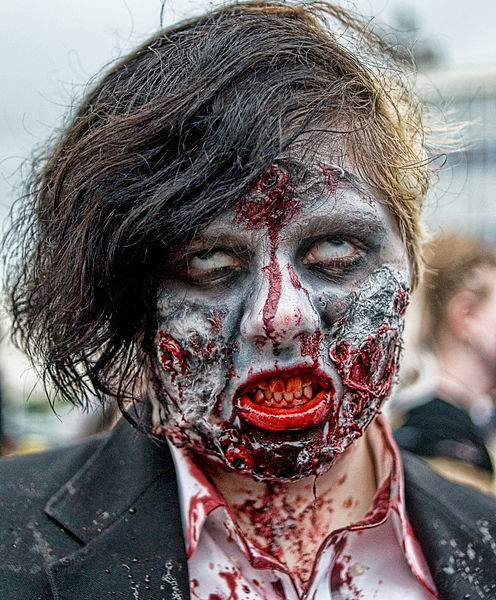 You never forget your first impression of a zombie: filthy clothing, rotting flesh, vacuous stare, and rancid halitosis (that alone is enough to make you hurl). It’s sad but true. We judge people by their appearance. Your company spent considerable money to participate so shine your shoes, press your shirt, and dry clean that blazer. Lights, Motion, and Noise. The undead and the living are both attracted to lights, motion, and noise. As much as we try . . . we can’t resist it. When planning your booth, ask yourself this, “Will my exhibit attract 200% more zombies than my competitors?” If the answer is “No!” then you need to get creative (or consider a ceremonious human sacrifice ever day). Intelligence. Zombies love brains and so should you. Being smart about your trade show marketing means you understand that trade shows are not the same as print ads, videos, brochures, or traditional sales calls. Trade shows are opportunities to attract new customers and strengthen existing relationships. Fresh Meat. Ever notice that zombies won’t eat other zombies. They like their meals fresh. Fresh ideas and innovation, particularly during a weak economy, propel one company forward while leaving another one struggling to survive. Trade show attendees go for two reasons: to find solutions to existing problems and/or discover innovations that will strengthen their operations or bottom line. Know Your Customer. In zombie-speak, we are customers. Good customers freak-out and get eaten. Bad customers ram a metal rod through a zombie’s skull. You want good customers, just without the “getting eaten” part. Good customers become good customers because we understand them and tailor our product or service to meet their needs. Preparation Matters. Zombies don’t need a trade show toolkit or an exhibitors handbook or an exhibit designer, they are 100% prepared the moment they go from living to undead. You’re not so lucky. You won’t succeed without thorough pre-show, show, and post-show preparation. Without Customers, What’s the Point? Wandering aimlessly is pointless, even to a mindless zombie. Zombies crave excitement. When a living, breathing human enters its proximity, it switches from listless to high alert. Serious exhibitors react similarly, albeit without the growling and moaning. We’ve all seen exhibitors who appear annoyed or resentful when an attendee enters their booth, interrupting their game of Angry Birds. What’s the point if it’s not about customers? There’s No Cure. Once a zombie always a zombie. If you love trade shows and are serious about trade show marketing, there’s no antidote. It’s in your blood. No matter how hard you fight it, once bitten, it’s incurable. Photo by Bob Jagendorf from Flickr. There you go counting again Mel. All in good fun with a hint or two of good advice. Once a zombie, always a zombie. Very insightful list and funny!